Home Did you know? Number Of Dogs In The World? One of the questions that people most commonly ask me is: “Just how many dogs are in the world today?” To find out the exact number of dogs on our planet is one of those “easier said than done” tasks since in many countries people don’t keep dogs inside their homes as pets. In some places, the dogs simply roam freely in the streets and nobody really owns them which makes counting them difficult and imprecise. The largest push to find out, at least how many pet dogs there are, has come from the pet food industry’s market research. This is a big industry and in the United States alone over 40 billion dollars is spent each year just to buy dog food. In the search to find out if investing in this industry would be profitable in various parts of the world a number of research groups have been employed to take a sort of census of pet dogs in target countries. The results that they have obtained are interesting although incomplete. 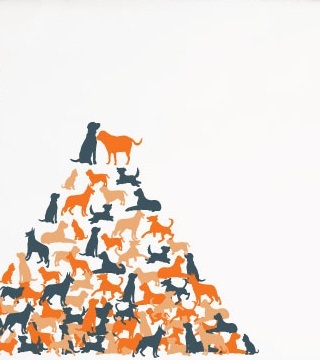 As of this writing, approximately 42.5 million households in the U.S. own one or more dogs and the total number of dogs in the country is in excess of 73 million. Canada has approximately 6 million pet dogs. In Western Europe, there are around 43 million pet dogs. The biggest pet dog populations in that region are in France with 8.8 million, while both Italy and Poland each have around 7.5 million, and the United Kingdom has 6.8 million pet dogs. In Eastern Europe, Russia has around 12 million pet dogs while the Ukraine has about 5.1 million. The data from South America is spotty, and the only figures that I could find were for Brazil, with 30 million pet dogs, Argentina with 6.5 million pet dogs, and Columbia with 5 million. There are also many uncounted unregistered dogs in this region especially if you move out of the larger metropolitan areas. The same holds for Australia with 4 million recorded pet dogs, and perhaps half again that number of strays or dogs that have become feral in the less settled regions of the country. The statistics in Asia are not particularly reliable. Owned dogs do not have to be registered in China, however, the number of pet dogs has been estimated to be 110 million. Even in the large cities which have dog registration regulations, many owners still refuse to get licenses for their pets, but some estimates peg the number of dogs in the capital city of Beijing alone at more than 1 million. There is a similar problem in India where many dogs are strays and unowned therefore not counted. Here the best estimate is that there are approximately 32 million owned dogs and perhaps as many as 20 million stray dogs. The Japanese, however, seem to be quite conscientious in registering their pets and the number of recorded pet dogs is 9.5 million. Perhaps the most difficult place to get statistics on the dog population is in Africa. While the nation of South Africa provides data suggesting that there are 9 million pet dogs in its boundaries, the information from the rest of the continent is sparse. The World Health Organization, who tries to monitor dog population on this continent because of the impact of rabies on humans, estimates that there are around 78 million owned dogs in Africa, but that there may also be in excess of 70 million unowned, stray dogs as well.